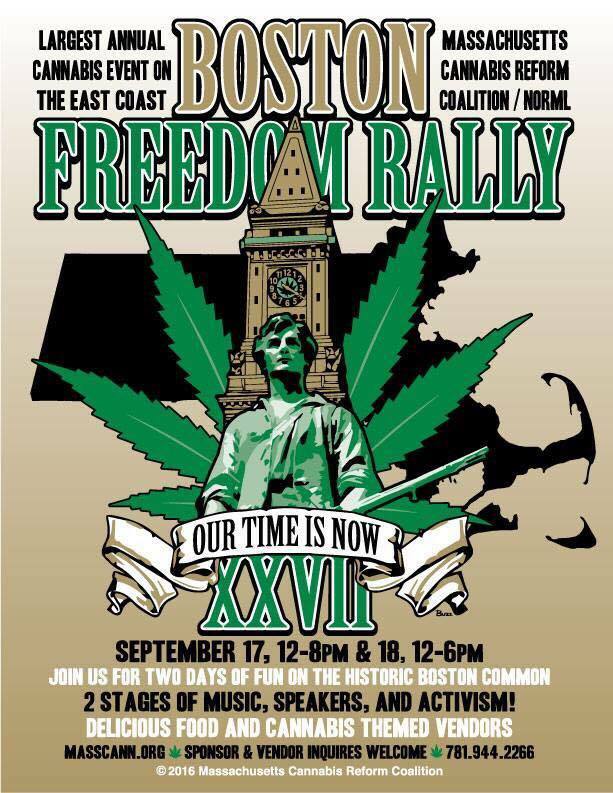 The Massachusetts Cannabis Reform Coalition (MassCann/NORML) is presenting its 27th Boston Freedom Rally, September 17 & 18, 2016, on Boston Common. This is a particularly significant rally because the initiative Question 4, To Tax and Regulate Marijuana, will be on the ballot this Election Day, and we will present important information for the voter to consider. In light of the disinformation and scare tactics of those who oppose legalization, we choose to present a well-reasoned and science-based discussion of the issues concerning Prohibition and cannabis. To this end, we will stage an Education Village on the Boston Common, with 8 pop-up tents with discussions of pertinent issues in each as follows; “Prohibition Is An Abject Failure,” “Repair The Community,” “How Do Activists Reply To Politician’s Scare Tactics,” “Support Groups,” “Cannabis As Humankind’s Life-Giving Manhattan Project,” “Cannabis Is Essential Health Supplement,” and “How To Grow, Make, And Take Your Medicine.” And of course, a tent devoted to “Peace and Love – The Spirituality of Cannabis.” There will also be a tent devoted to panel discussions. These will be streamed and put on https://masscann.org. We are sending invitations to our Education Village, handwritten on hemp paper to be hand delivered to our Governor, Mayor, Attorney General, and Speaker, to come and participate in an open-air campus, all conveniently staged at their doorstep, with awesome music in the background.